Multibeam-echosounder and sidescan-sonar data, collected by the National Oceanic and Atmospheric Administration in a 69-square-kilometer area of northwestern Block Island Sound, are used with sediment samples, and still and video photography of the sea floor, collected by the U.S. Geological Survey at 43 stations within this area, to interpret the sea-floor features and sedimentary environments. Features on the sea floor include boulders, sand waves, scour depressions, modern marine sediments, and trawl marks. Boulders, which are often several meters wide, are found in patches in the shallower depths and tend to be overgrown with sessile flora and fauna. They are lag deposits of winnowed glacial drift, and reflect high-energy environments characterized by processes associated with erosion and nondeposition. Sand waves and megaripples tend to have crests that either trend parallel to shore with 20- to 50-meter (m) wavelengths or trend perpendicular to shore with several-hundred-meter wavelengths. 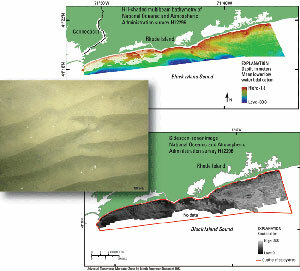 The sand waves reflect sediment transport directions perpendicular to shore by waves, and parallel to shore by tidal or wind-driven currents, respectively. Scour depressions, which are about 0.5 m lower than the surrounding sea floor, have floors of gravel and coarser sand than bounding modern marine sediments. These scour depressions, which are conspicuous in the sidescan-sonar data because of their more highly reflective coarser sediment floors, are likely formed by storm-generated, seaward-flowing currents and maintained by the turbulence in bottom currents caused by their coarse sediments. Areas of the sea floor with modern marine sediments tend to be relatively flat to current-rippled and sandy. McMullen, K.Y., Poppe, L.J., Ackerman, S.D., Blackwood, D.S., Glomb, K.A., and Wood, D.A., 2014, Sea-floor geology in northwestern Block Island Sound, Rhode Island: U.S. Geological Survey Open-File Report 2014–1018, 1 DVD-ROM, 13 p., https://dx.doi.org/10.3133/ofr20141018.